Αν αυτό που ψάχνετε είναι μια ιδιοκτησία σε καλό σημείο της πόλης Halong, μην ψάχνετε πιο πέρα από το Paradise Elegance Cruise Halong. Μόλις 12 km από το κέντρο της πόλης και 130 km μακριά από το αεροδρόμιο, αυτή η 5 αστέρων ιδιοκτησία προσελκύει πολλούς ταξιδιώτες κάθε χρόνο. Από τη βολική της τοποθεσία, η ιδιοκτησία προσφέρει εύκολη πρόσβαση σε κορυφαίους προορισμούς της πόλης. 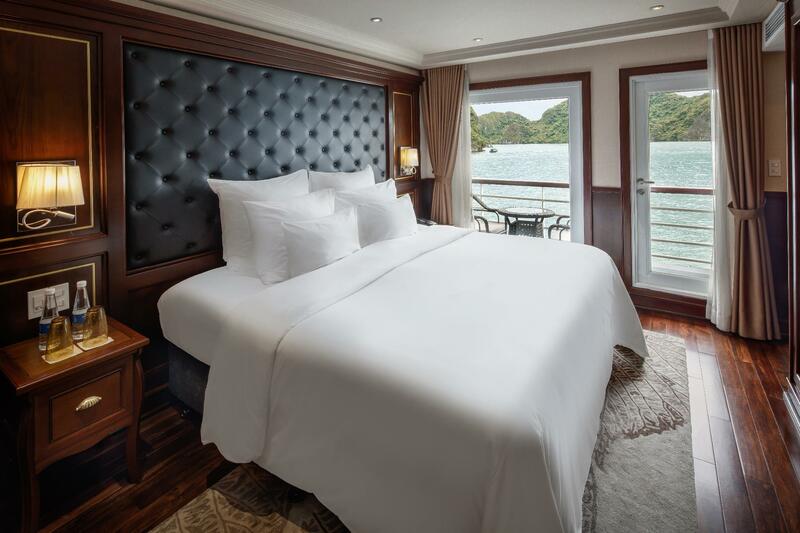 Το Paradise Elegance Cruise Halong προσφέρει άψογη εξυπηρέτηση και όλες τις βασικές ανέσεις στους ενθουσιώδεις ταξιδιώτες. Αυτό το ξενοδοχείο προσφέρει πολυάριθμες εγκαταστάσεις για να ικανοποιήσει ακόμα και τους πιο απαιτητικούς πελάτες του. Όλα τα καταλύματα διαθέτουν τις απαραίτητες ανέσεις για να εξασφαλιστεί μια ασυναγώνιστη αίσθηση απόλαυσης. ΟΙ ψυχαγωγικές δραστηριότητες του ξενοδοχείου, οι οποίες περιλαμβάνουν τις πλοία, σνόρκελινγκ, θαλάσσιο πάρκο, υδρομασάζ, σάουνα, είναι σχεδιασμένες για να χαλαρώνετε και να ξεφεύγετε. 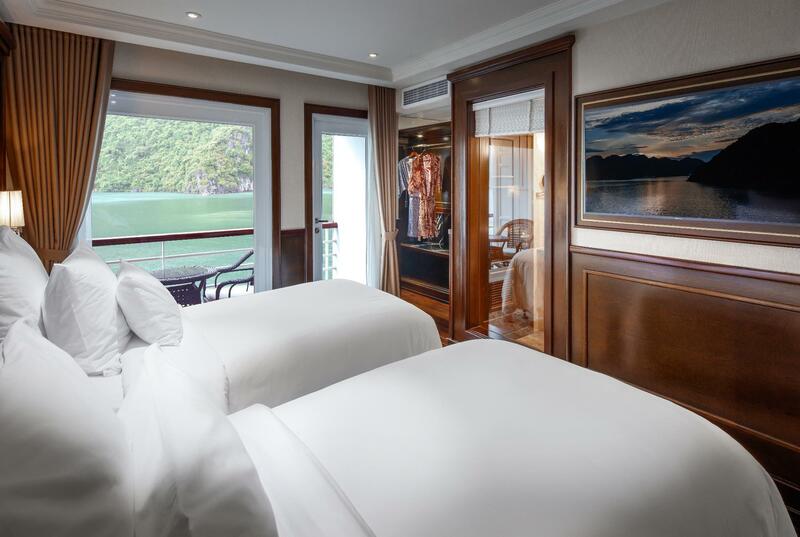 Το Paradise Elegance Cruise Halong είναι μια έξυπνη επιλογή για τους ταξιδιώτες στη Halong προσφέροντας κάθε φορά μια ήρεμη και ήσυχη διαμονή. Free Wi-Fi is available in the public area on the boat. Internet signals may be interrupted due to the limestone shielding. Boarding time starts at 12:00 PM at Tuan Chau Island Halong Wharf. Latest check-in time is at 12:30 PM but will incur additional charges. Infant under 4 years old stays for free if using existing bedding. Maximum infants allowed per room is 1. Maximum children 5 – 11 years old allowed per room is 1. Children 5 – 11 years old will be charged VND 3,473,000 per child per night for full board, cruise program, tax and service charge. It is payable at the property upon arrival. Extra bed is subject to availability and depending on room type. Guests are required to pre-register with the cruise at least 7 days prior to arrival. The cruise requires the guest’s full name, gender, date of birth, nationality, passport number or ID, and visa expiry date. The guests who do not register in advance will not be boarded. It was an amazing experience but the trip could have lasted longer and the excursions could have been better. For the monies we paid we felt the trip ended too early and could have checked out around 12/2pm from the boat. Simply amazing! After a comprehensive internet research decided to go for Paradise Elegance cruise. Comes with a higher price tag but worth every penny in return for the standard received. 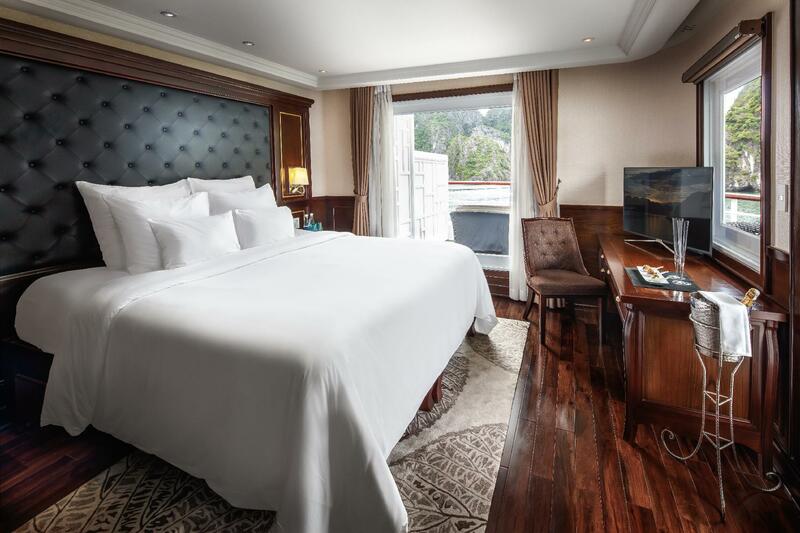 Ship is new, high quality and tastefully decorated. Rooms are 5 star hotel standard. Extremely clean, comfortable with all the amenities including a powerful hot shower and bath. Food amazing; great and tasty bufet selection and high end a la carte diner. 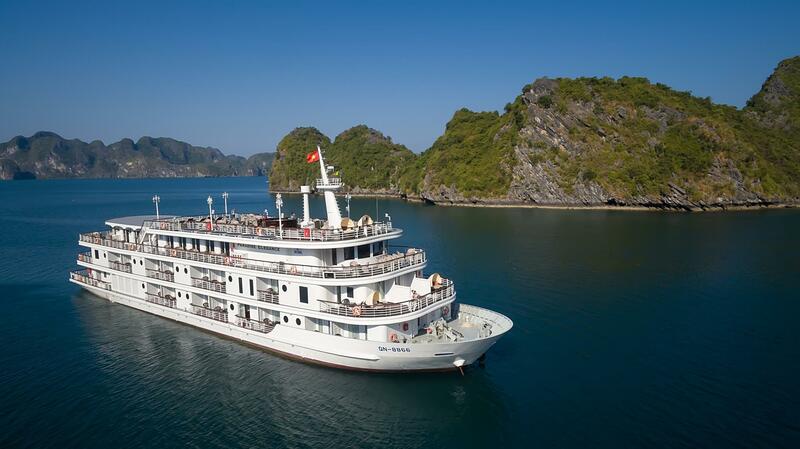 Paradise itinerary goes through the real Halong Bay, hence you will see the highlights. Staff are very professional. Have to also mentiom a very professional and timely pick up drop off service from the hotel carried in a luxurious mini van with leather seats and available water. Considering a number of low quality and service ships, questionable safety I would not hesitate to pay little extra for what Paradise has to offer. It cost me $1300 for clicking the wrong date and then cancelling immediately. My intention was to book my trip for december 3-5/18. Mistskingly. I selected november 6-8/18. Upon teceiving confirmation., i immediately cancelled reservation and made reservation for dates in december. This all too place in a matter of minutes. A month later, I discovered my initial reservation was still on my credit card so i contacted Agoda. They informed me that my dates were 12 days from the dates reserved (oct. 26/18) so i will pay 100% for mistaken booking. I pleaded with them seceral times to consider the circumstances......it was an accidental booking, i cancelled it within minutes, i promptly rebooked the proper dates. None of this matttered to them. They did blame the property for the non-refund so i contacted the property. They would not refund either even though their cancellation period was 7 days. Each company blames the other for the incident. Meanwhile, i pay $1300 for nothing! 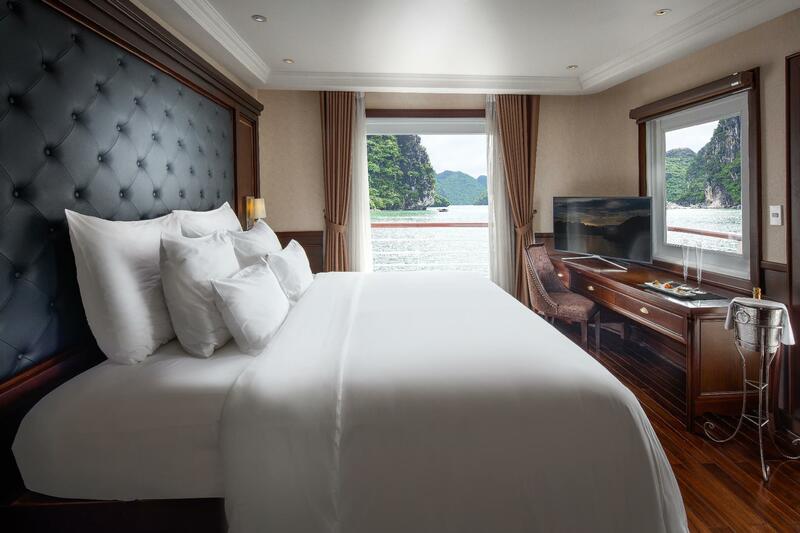 The Paradise Elegance is one of the best cruise boats at Halong Bay. I wasn't sure what to expect when I made my initial booking, but I certainly was NOT disappointed. The staff and manager were amazing and extremely helpful. My mother and I had a wonderful time on our 2 day cruise around Ha Long Bay. Thank you so much for your value. Paradise Cruise Team. We chose this boat because it looked luxurious and suited our needs for this trip. The price was higher but it was a special occasion so we went ahead and were happy with our choice. The boat is modern, food selection is quite good, but you have to buy your own drinks and pay extra $20 if you want kayaking. The private balcony was nice and the bed comfortable. The staff were friendly and professional and assisted us whenever we needed them, especially the waitresses and Maria and Mia who run the ship. Not much cruising on the 2nd day unfortunately and back at port by 10.30am so would consider the 3D-2N trip in future, but only if it went to different parts of the bay. Had a wonderful overnight stay! we didn't encounter any problem at all. the FOOD is awesome!!! the staff are friendly and accomodating. the room and the bathroom is luxurious, it's really worth it! Paradise cruises are not cheap, but you get your money's worth. The ships are new, well designed and very comfortable. Cabins are very nice and comfort, and the onboard facilities and service top notch! Good mix of local and Filippino crew. The onboard spa is also very good. The cruise was good as there were many activities to keep you entertained throughout the 2D1N. Staff were friendly. We had to pay extra usd100 per couple due to peak season n another usd100 for transfer. Food on board was good esp the dinner. Our room was clean but unfortunately it’s at where the anchor was so it was very noisy when the anchor was let down n pulled up. Good cruise. Give it a try!! Great food. Attentive crew. Clean room. You will get bored!!! Manager and staff working very good! Nice view from the deck and food and beverage was excellent. Great night to enjoy thousands of lime islands. The room is somehow small for couple, but it's clean enough to stay one night. The food is good and staff is professional..overall excellent!